You must contact us for a shipping rate! Visually looks like the 10' Professional Flat series. Each panel contains sound deadening interior (no metal interior frame) and is encased in the same outer fiberglass and gel coat shell coated with Imron paint. Four horizontal rows of pressure treated 2 x 4's (provided) are mounted to fence posts. Holes are the drilled through panels at appropriate heights (instructions explain this) and attach panels with provided green faced bolts. Installation requires more carpentry skills, however it remains very simple and quick to mount. Although not as quiet as our other backboard's, it is quieter than an average wood backboard. It looks much better and does not fade, warp, peel or rot in 2-3 years like wood backboards. 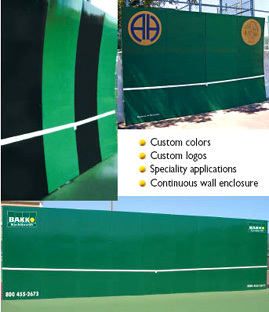 Economy series is competitive in price when factoring cost of materials, design and construction, filling, paint/repainting, installation and labor of a wood backboard. Economy series is often sold for driveways and backyards but requires mounting 2 or 3 standard fence posts in the ground. 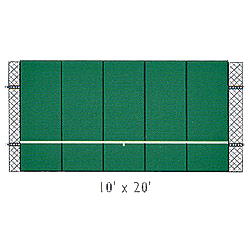 Space required: Width of backboard and length of 40' (service practice requires 39' , distance from service-line to backboard). Typically purchased by budget conscious court owners, driveways, schools and parks where noise is not a major issue. ALL BACKBOARDS ARE MADE TO ORDER. PLEASE ALLOW 4 - 5 WEEKS FROM TIME OF PURCHASE FOR DELIVERY, DUE TO THE LENGTH OF THE MANUFACTURING PROCESS. IMPORTANT SHIPPING INFORMATION, PLEASE READ! All backboards are shipped via common carrier freight lines to curbside only for residential deliveries. Customer is responsible for unloading of the backboard from the truck. You will be contacted by email as to the delivery date and should be prepared to have people on hand for unloading and moving to your desired location. Use caution when selecting preferred fence location. In the sun belt, the backboard should not face the West due to intense sun. This probably will accelerate aging of the panel surface and paint. Ideally the panels should be at right angles to the path of the sun so during practice a player never directly looks into the sun. If placed on a tennis court at an end, the white lines of the court may be used as practice reference points/lines. The Best Backboard In The Business Is Also Your Best Value! There are many different types and styles of backboards. Most, however, fall into these categories: wood, concrete/concrete blocks, plastic, net and Bakko. All backboards provide the user with a great practice partner and aerobic exercise for players of all ages and ability levels from beginners to top-playing professionals. Bottom line is, "You get what you pay for!"